The ASBIGAP program is open to any Howard University or UC Davis undergraduate interesting in pursuing graduate study in atmospheric science. agree to complete at least one upper division elective appropriate to the student’s research area by the end of the junior year. This elective will be chosen by mutual agreement of the student and program faculty. a one-page statement of purpose that describes the applicant's research interests. Please save the file with the filename ASBIGAPstatement_LastnameFirstname. 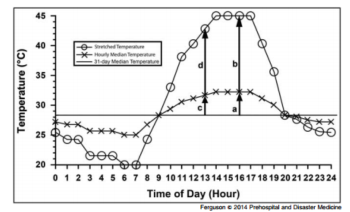 Kyaw Tha Paw U collaborated with UC Davis physicians to model effects of changes in temperature and humidity on disaster preparedness by medical facilities. The figure illustrates results of a stretching algorithm on temperature profiles for Hurricane Katrina. Complete the web form and email items (2)-(4) to Carole Hom (clhom at ucdavis dot edu); please include ASBIGAP application and your name in the subject line. For full consideration, please apply before 28 February 2017. All applications will be reviewed by a joint committee of Howard University and UC Davis faculty, with the option of interviewing finalists by videoconference. Applicants will be selected based on the strength of their record and fit of research interests to appropriate faculty. Applicants will be notified of their status in a timely way.